Han Solo Wouldn’t Cut it in Colonel Graff’s Amy! 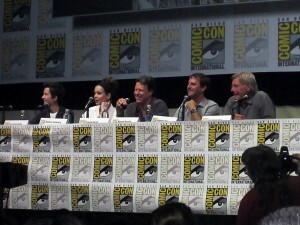 On Thursday, July 18, 2013 we had the wonderful opportunity to sit in the first couple of rows at the ‘Ender’s Game’ panel at San Diego Comic-Con. After we watched a brand new trailer (We live blogged about it, here!) We had a good laugh with writer/director Gavin Hood, producer Bob Orci, Ender Wiggin actor- Asa Butterfield, and Petra Arkanian actress- Hailee Steinfeld. Take a listen below or read our full transcript of the Q&A portion after the jump! Moderator: Bob, what’s your biggest challenge when you’re taking a book that people adore and then turning it into a movie? What were your challenges? Bob Orci: Normally find the writer, but I didn’t have to write it. Gavin actually had the terrible challenge of adapting this, which was great. You want to do what’s true to the book, but you also have to understand that you’re making a movie out of it. You want to take what you love about the book and not betray it and not betray the fans, but also show the people who don’t know the book and who aren’t fans of the book why you loved it. You cannot take a love of the book for granted. An audience is going to come see this hopefully based on its own merits and not because of what happened before. That’s the line you have to walk. Moderator: Asa, how did you get inside of your character’s head? How did that feel? What was your way in? Asa Butterfield: It was pretty big, to say the least. Me and Gavin talked a lot prior to shooting about where he wanted to take the character and how he envisioned the movie as a whole. It was exciting for me to bring such a beloved novel and someone like Ender to life. It was a challenge, but we had a lot of fun doing it. Moderator: Hailee, was this physically demanding to you? Hailee Steinfeld: It was. It was the first time that I ever had to physically train for a film. We had about three weeks of training before we started filming. We went to the space camp. We had a military boot camp where we learned how to march, salute, and learned to do cadences. It was very challenging and I loved it. Moderator: You compare it to an acting class and it’s a whole other level of stuff that you have to learn. Hailee Steinfeld: Yeah it was. Moderator: Mr. Harrison Ford, it’s your second Comic-Con appearance. Playing Ender’s mentor, what drew you to the film, and what are you bringing to it? Harrison Ford: Well, I would correct your observation. He is not so much Ender’s mentor as he is Ender’s manipulator. […] I was drawn to the complexity of the moral issues here, questions about the complex moral issues that are involved in the military. This book which was written 28 years ago imagined a world that has become an everyday reality. The ability to wage war removed from the battlefield is one of the realities of our life now. Child warfare—this was unknown 28 years ago. But the issues of manipulation of young people for their value of soldiers because of their special skills, their motor skill capacities, because of their conceptual freedom, is something that was really complex and interesting to me. I was delighted to be involved in playing a character that doesn’t have these concerns and brought them into public consciousness. Moderator: Gavin, as a director, what were some of the challenges you had and some things you didn’t think you would be able to accomplish because it’s a very complex world? Gavin Hood: It kind of divides into two things. I love the book for two principle reasons. Obviously, this is an amazing environment. The Battle Room, which I really think you guys are going to love—I hope you will, because it is truly beautiful. So there’s the technical challenge of bringing that kind of visual idea to the screen. But, more importantly, what I loved and really at the heart of this book is what Harrison is alluding to, is that this is not a simple story of good and evil, and the good guy gets wronged and goes on a revenge mission and beats the bad guy. I’m kind of bored with that line. We’ve seen enough visual effects movies. Visual effects don’t do it for us unless they’re supported by a great story. And this is a great, complex story. [Applause] In hearing you like that, as opposed to “let’s see some cool effects”—which you will see!—but during which you want a great story really means a lot. And that’s what it is. To have characters that are not simple, that wrestle with their own capacity for good and evil, and to have actors with the intelligence—of course Harrison on a good day—it’s amazing! And when he’s not having a good day you bring in Sir Ben Kingsley and he makes up for it, so it’s all good. And you get those egos going and boy you get some chemistry, man. It’s awesome. I was very blessed to have material that is complex, intelligent, wrestling with issues, as Harrison says, that are really profoundly important today. And then to find out that you can’t fake intelligence. You’ve got to have—you’re quite a smart guy, Asa—and such a humble and very loving guy. Searching for the right Ender Wiggin took a while. I’m so pleased to have found this young man and set him up against Harrison Ford and Sir Ben Kingsley, and up against Hailee Steinfeld, who’s no slouch herself, really makes the director’s life very easy. I had a great time with these folks. Moderator: Asa, was there any sort of “Oh my gosh, Ben Kingsley! Harrison Ford!”? How did you come to work every day and put that out of your mind and just focus on the work? Asa Butterfield: I think, as any actor would, they know that they’re acting against Han Solo. However amazing that is—I’m not really sure, if I’m honest. Moderator: I’ll tell you how it is. You’re British and you’re slightly better than we are. You sound better. You guys look better. I don’t know. You’re just better. Fan #1: Thanks so much for being here. The footage looks awesome. There’s actually been a lot of controversy about the author of the book. How involved was he in the making of the film? Bob Orci: The truth is, my first reaction when this came was up was you never want to invite controversy. Obviously, we were first concerned with anyone that might be hurt by anything that comes up and anything that we are associated with. But we decided to use the attention that’s on us now, no matter how bad it is, to completely and unequivocally support Lionsgate’s statement in defense of LGBT rights, part of all human rights. A lot of people worked on this movie. A lot more people are working to get this movie out, and to market it and to put it out, and I would hate to see the efforts of all these people thwarted for the opinions of less than a percentage of the people behind this movie. And really because the message of the book and of the movie is tolerance, compassion, empathy—all things that we hope are going to live on long beyond any statements that any of us make. So rather than shying away from the controversy, we are happy to actually embrace it and use the spotlight, no matter how we get here today, in support of LGBT rights and human rights. Fan #2: ‘Ender’s Game’ is so amazing because it appeals to people on so many levels. How did you pick what themes you wanted to explore in the movie? Gavin Hood: I would like to think that we focused on the same themes that are in the book, which are the themes of leadership, the themes of compassion, the themes of empathy, tolerance, themes of self-identity—how do I define myself in a complex world where my nature can be like my brother, Peter, who is aggressive, or like my sister, Valentine, who is compassionate—and how do we, as we move through life, arrive at a place where we decide how we lead not only others, but ourselves. Leadership is not just about how you lead others, but also how you lead yourself, and how you decide what your own moral position is in the world. Ironic that we are talking about a moral position on a day when this controversy is arising. I think those great themes in the book are what we are all drawn to and I think it was really fun to be able to translate those themes to the film. If I had one goal, it was to be true to the spirit of the story of Ender Wiggin. That’s what I got out of the book and I hope I have delivered that to you guys in the film. Fan #3: First, I would like to thank Mr. Card on behalf of the fans for his marvelous work over the years in entertaining us. My question is for everyone on the panel. If you could choose one prop to take home from the set, what would it be? Asa Butterfield: That’s a good question. Moderator: What props didn’t you take? Asa Butterfield: A prop that we did actually get sent is this futuristic wash kit, which included some futuristic hair brushes and a futuristic toothbrush. Moderator: What made it futuristic? Does it say “future brush” or something? Asa Butterfield: I’m not sure, actually. Like flashing lights. Harrison Ford: Toothpaste that squeezes you! Moderator: Okay, I want to stop you right there. Moderator: Oh, just do it. I want to know too. Fan #4: What would be their first words to each other? Fan #5: Mr. Ford, I am a big fan. I used to pretend I was Indiana Jones when I was a child. Until the day I stole a rock and broke my leg, but I’m still a fan. Moderator: Are you blaming him? Fan #5: Mr. Ford, do you think Han Solo would be a good soldier for Colonel Graff’s army? Harrison Ford: You and I have a lot in common. I used to dream about being Indiana Jones when I was younger too. Not so much anymore. I don’t think Han Solo would be good as a soldier in anybody’s army. I think he’s what we a call now an independent contractor.